To download the free liability waiver form in PDF format, please go to Free Liability Waiver page and download Free Liability Waiver form in a PDF format. To download the free Liability release form in PDF format, please click Free Liability Waiver. owns a swimming pool and is hosting a pool party. The guests of the party would need to sign a liability waiver form in order to utilize the pool. By doing this way, if someone is harmed during the party or event, they have waived their rights to a law suit and can not sue you for their becoming injured. There are situations or circumstances however that liability can not be waived, for instance: someone becoming injured as a result of your negligence. What should you know about Liability weaver? Joining a gym, playing in a sports leagues, running or riding in a race, going skiing is all activity that carries a risk of an accident. Before you join such activities you will be asked to sign a Liability Waivers or release of liability form. So, if the accident takes place and injury does happen, the institutions are protected from a lawsuit from the injury person/party. Waiver of Liability agreement is an agreement between two parties the releasor and the release. The releasor is a company or person who is potentially responsible or liable. The release is an individual who promises not to sue. When Waiver of Liability agreement is signed, the release knows and understands the risk and the claim that may involve and agree that he or she will not sue the release. In most cases, A Release of Liability Form is used in an accident that causes property damage or car wrack that has already happened. Both parties agree not to go through a lengthy court process and settle the dispute out if the court accordingly. In many cases, both parties involved have to go a lengthy debate to reach an agreement that they need. The releasor: is an individual who promises not to take legal action or not to sue against the organization or the owner of the event or activity being attended. The release is the organizer or the owner of the activity or event which is at risk and can be sued. The effective date is a date when the agreement comes to affect. Governing law: should mention a state law that will be used in case disagreement rises. Consideration: mention the amount of money, promises or something that has legal value to compensate the agreement given. Unless you are a lawyer writing Liability Waiver Form is not an easy task. In this case, you can ask your lawyer to provide you with a sample of the waiver form. However, if you don’t have access to any lawyer, you can search on the internet for free liability waiver form pdf or liability waiver form pdf that you need. Accident Happens. Don’t Take the Risks. There are limit to the amount of risks every company want to assume. You may want to provide your clients with best form of service or insurance but not setting a limit to the risk that your company can deal with may take you out of business. You need waivers if you offer various types of services to protect your business and investment and avoid facing the law next time a client comes complaining with an injury or other situations he may have found himself in. A liability waiver is a legal document which an individual who wishes to participate in one activity or event will sign that he knows about the risks involved with the activity or event and promises not to hold the owner or another party responsible in case of personal injury. Liability waiver is in fact a document that proves the agreement between the two parties before they go into business with one party knowing all the risk involve with the event and acknowledging he will not sue the other party for damage or injury that may arise from his participation in the event. The person that signed the waiver will give up the right to hold you or your business responsible in case of loss or accident. Liability waiver is also known as liability release forms or release form.In case a damage or injury arises, a case can be filed against the party at fault. However, there is an exemption to that rule. That is only if a waiver of liability is signed. A waiver of liability is a document signed by the party in risky pursuit and is being held by the other party as a protection for his right of not being sued. By signing the document, all right to blame and seek justice through legal proceedings when any further action fails is no longer possible. The waiver of liability commonly occurs in transactions with regards to surgery, bungee jumping, flying, and other dangerous acts like that. For an example, if you own a Ski and Snowboard Rental Company; obviously there are some risks involve with someone skiing or snowboarding especially for beginners. Chances of injury are high when someone is participating in this type of activity. Your clients needs to understand the risk and injury that may arise from skiing or snowboarding and he needs to promise albeit by writing it down and signing that he will not sue or hold your company responsible when such injury arise. The use of liability waiver is mostly found in sports which are considered inherently dangerous. These are sports or activities that are considered to cause injury. If you are a personal trainer or sport instructor, you obviously need your clients to sign liability waiver so that you can protect your business. When Can You Use Liability Waiver? When your client is dealing with toxic or hazardous materials. Even if you have provided all the safety equipments and training necessary to protect your client against injuries, he still needs to sign the waiver form acknowledging he will not sue you for injury that comes as a result of his participation in such activity. Can You Legally Enforce Liability Waivers? Totally. When your clients sign a liability waiver form, it forms a contract or you can include it as part of contract you have already drawn. You can enforce liability waivers under contract laws. Liability waiver forms must be written as if they were a legally valid contract with dates, signature and terms of contracts clearly written. Construction business is a very risky business; there are heavy machines, equipments and tools that posses’ great risk those working on the site. Your on-site constructors needs to understand the risk of working with these heavy machines and lifting irons, blocks, pans and other equipment that can pose potential risk to them. They need to understand the risk and put these in writing as a liability waiver (Construction Liability Release Form) not to sue you or your company in case of any injury or death. Are you hosting a party that involves trampoline event? Do you want to take responsibility for any injury sustain by kids jumping on the trampoline. Ensure that parents sign your liability waiver (Trampoline Liability Waiver) form before allowing their kids to jump on trampoline. Dog are extremely friendly animal, but when they are frightened they may bite someone or chase someone and cause the person to sustain injuries. Your insurance company needs homeowners that own a pet to sign pet liability waiver (Dog Liability Release Form) allowing the owner to bear the responsibility in the event of dog bite. Some sports are considered inherent dangerous. When your clients participate in these types of sports, they need to sign liability waiver to release you of any responsibility that may arise from it. If you are a trainer in sports like paintball (Paintball Liability Release Form), volleyball, football, golf cart, ski, snowboarding, parachuting, and other extremely risky sports, your participators needs to understand the risk involve with those sports and sign the liability waiver form accordingly. Horseback riding can be fun but at same time it is very dangerous. Do your rider understand the risk involve in engaging in this extremely adrenaline-boosting sports? Is he willing to take responsibility for his own actions? Can he put it in writing? Make sure he signs liability waiver form before he goes for the fun riding. New gym houses are opening up on every corner of the street almost every day. Do your clients understand the dangers that can come from lifting those equipments? They may seem fun, interesting and power-filling but they also pose some dangers. Get a release of liability form (Gym Liability Waiver Form) from your client before when he is signing up for the gym class. Or get a Fitness Liability Waiver Form if you work for Zumba Fitness Center. There are other types of liability waivers you may need like Swimming Pool Liability Waiver, Volunteer Liability Release Form. It mostly depends on the type of activities you are doing. You definitely need liability waiver to protect yourself from assuming unnecessary responsibilities and acquiring more costs. There are two types of waiver of liability – the implied and express. It is implied when there is no signing involved, but it is presumed that you are already waiving your right from the start. The best example for this is when you choose to watch a baseball game, and you unluckily got hit by the ball. It is express, on the other hand, when the right is waived literally in writing and is validly recognized and signed. The best example for this is when you choose to have a dangerous operation. What is a Property Liability Waiver? A property liability waiver is a legal document used to relieve a party of a future claim for a house or property damage after initial repair or payment has been done. Before you make any payment, you have to make sure that the property liability waiver is appropriately signed. Liability waiver protects you for future claim. For example, if you drive a car and accidentally you hit someone’s fence or home, you have the responsibility for repairing any damage caused by your care. In this case, your insurance will take care of the problems. After all the damage had already repaired, you have to ask the homeowner to sign a property liability waiver. By doing so, you can be protected from the future claim. However, it is important to know that the property-liability waiver is a legal document. Therefore, should be written correctly. 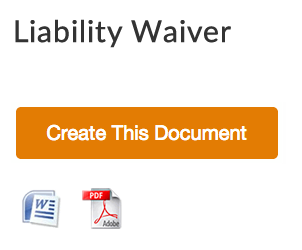 If you are unfamiliar with such a document, you can download release of liability waiver template from the internet. Another example of a property liability waiver can be applied to an Independent contractor. Independent contractor has a risky business. The owner of the contractor can be sued for property damage as he or she held liable for the damage. Therefore most independent contractors are covered with an insurance cover. For example, if you are running an independent contractor and you are sued by your customer for property for damage caused by accident. You undoubtedly will ask your insurance company to repair the damage. Once repair finished and your customer is happy with the repair, you will ask your customer to sign an independent contractor liability waiver form. This form is a legal form that will protect you from your customer for future claims. That means that once your customers sign a liability waiver form, they are satisfied and agree with the result of the house repair that you have done. Therefore, they will not be able to have another claim in the future. The contractor liability waiver form that they have signed prevents them for future claim. It is worth to mention that liability form is a legal document. Therefore, you have to write your liability waiver form carefully. If you are new in this matter and you never write a liability waiver before, it will be better for you to search for liability waiver form on the internet. The internet is a good source of different short liability waiver form that you need. You can find different types sample waiver form on the internet. These forms are usually can be downloaded in different types of file. You may be able to download waiver template word, or you can get it in pdf file. Another term used to call the waiver of liability is the release of liability, release, waiver, or liability waiver. The names it is being called is sometimes related to the specific action or event that it will be used. The forms for the waiver are not generalized. Each establishment may make his own form of waiver. But most probably, they should have the following. The danger that can possibly happen must be disclosed on the waiver. It must be described in full even if the possibility to happen is low. The signer must be able to understand what he will be going into as well as the highest level of risk associated with it. This is the most important part. The one at risk must sign the waiver to make it effective; otherwise, it will be of no use. The form must be signed by one customer only. For other customers, other individual forms must be given. The waiver of liability also works just like the hold harmless agreement, which applies commonly to the products or downloads. The former is just the deeper case. The best example for the latter’s waiver is the ones you see on the hot choco cup served in McDonald’s wherein you can see the phrase, “Caution: Contents may be hot.” It is also just like the liability insurance, which waives the right to claim in return for defective or unwanted insurance. The waivers serve as protection, but that does not mean that danger is likely to happen. Just believe that the one who let you sign the waiver will truly do his best not to provide you any injury or bring you into harm’s way intentionally. No practicing professional will do that cruel thing for sure. Do You Need A Lawyer for Your Liability Waiver? You may not need a lawyer to be present during the signing of the liability release form however you require a lawyer to help you draw up a valid liability waiver form and make it legally binding. Call for assistance of contract lawyers to help you in writing your liability waiver form today. Do you need any other different types of legal forms? Consider Speedy Template as your form portal which you can download forms like Do Not Resuscitate Order Form at no cost. Do Liability Waivers Need to Be Notarized? Skiing, running joining the gym and playing in any sports league are some example of an activity that requires signing liability waivers. If an injury or accident happens, liability waiver protects the company or institution from liability and prevents any lawsuit against them. However, not all liability waivers are enforceable. If your liability waiver is improperly worded and sign, your liability waiver may be invalid. Therefore, it is very important to draft your liability waiver correctly. You have to use clear and understandable language. Some liability waiver is very difficult to comprehend as a too much legalese word is being used. In this case, you have to try to minimize the use of legalese word. Legalese word is needed, but if your customer doesn’t understand your liability waiver, most likely that the court will not uphold your document and claimed as an incorrectly drafted document. Make it easy to read. In many cases, court criticizes risk agreement or liability waiver that written too tight or printed with too small size letter. In this case, you have to use at least ten size font or larger. Try to capitalize or bold important section of the agreement. Offer full information. It is very important to you give complete information related to the activity that they are going to involved. You have to mention a full risk that may happen they perform the activity. Try to keep your liability waiver short. This is a bit tricky. You have to write down all information related to the potential risk of the activity. At the same time, you have to write your liability form as short as possible. Depend on the scope of your service, your liability waiver or risk agreement should not be more than more than five pages. If your liability waiver more than five pages most people will hesitate to read it. This can be a major source of debate in the court. Give the risk agreement/liability waiver beforehand. Sometimes giving a liability waiver form beforehand is not possible. However, it is very important to make sure that all participants have enough time to read the risk agreement before they sign it up. Obtain the signature. Generally, parents or the guardian have to sign a liability waiver for minor/children. However, you can ask the minor to assign in addition to their parent signature. This provides an additional defence the children/minor knows about the risk of the activity that they are going to involve. Liability waiver can be reinforced if it is properly drafted and signed. It is very crucial to comply with the rule and regulation. Therefore you have to consult with your attorney to draft your liability waiver. Can You Sue Even If You Sign a Waiver? Most people think that since they signed a waiver and knowing the risk of the activity that they involve, they don’t have a legal stand for a personal injury lawsuit. It is true that waiver can make your injury lawsuit more complicated, but you still able to seek injury compensation if the injury can be prevented. It is important to know that the company has to provide a safe environment and equipment. The waiver that you have signed does not exempt their responsibility from ensuring safety for the entire participant. You are responsible for your safety, but you should not accept if the business makes some safety error. For example, before you participate in a bungee jump, you required to signed waiver. In this case, you expect the company to train their staff correctly and make sure that all the equipment is in good condition. If you are injured from an improper procedure or faulty equipment you have a case for injury compensation. When signing, you ware under the influence of drug or alcohol. In this case, you should be prevented from doing any activity at all. You don’t want to sign, but you were forced to sign. The waiver itself is too difficult to understand. If the waiver is written in tiny text, then it is difficult to read and to understand. Some time the waiver written in many pages. This discourages the participant to read the disclaimer. On the eye of the law, you can be blamed for writing too long and too complicated. Fraudulent waiver if the waiver doesn’t disclose the accurate level of risk then the waiver can be determined as a fraudulent waiver. Therefore, it is very important to write all risk down to your waiver. How to Write a Liability Waiver to Release Liability? Free Liability Release Form – Accident Happens. Don’t Take the Risks.